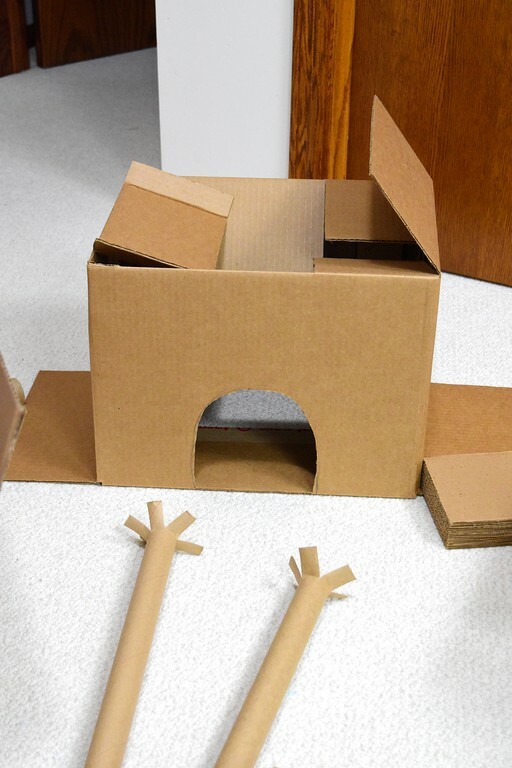 There's something about cats and cardboard, I've heard. Take scratching toys, for instance. 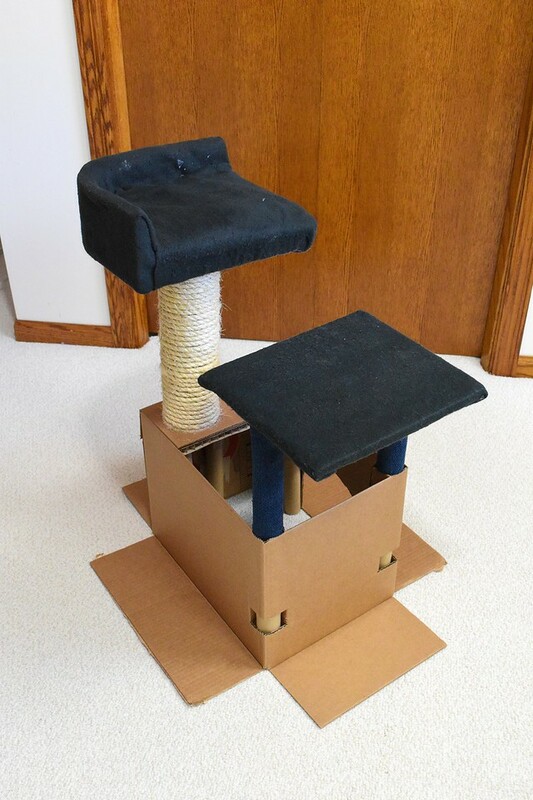 Until I had cats, I had no idea there were such things as corrugated cardboard scratching recliners and scratching hangers. And then when I first heard about them, I couldn't decide if I was thrilled or offended. 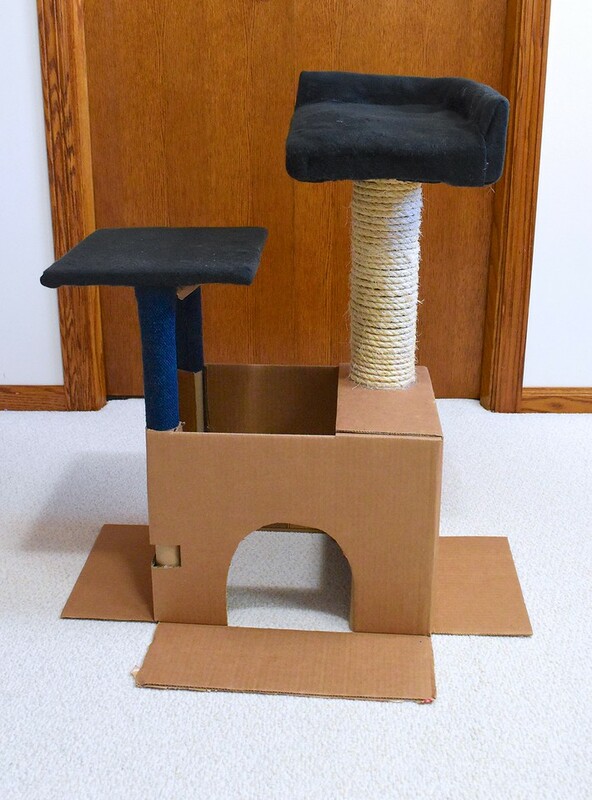 I mean, it seemed exceedingly disrespectful to cardboard that something be made from it with the sole function of being clawed to death. 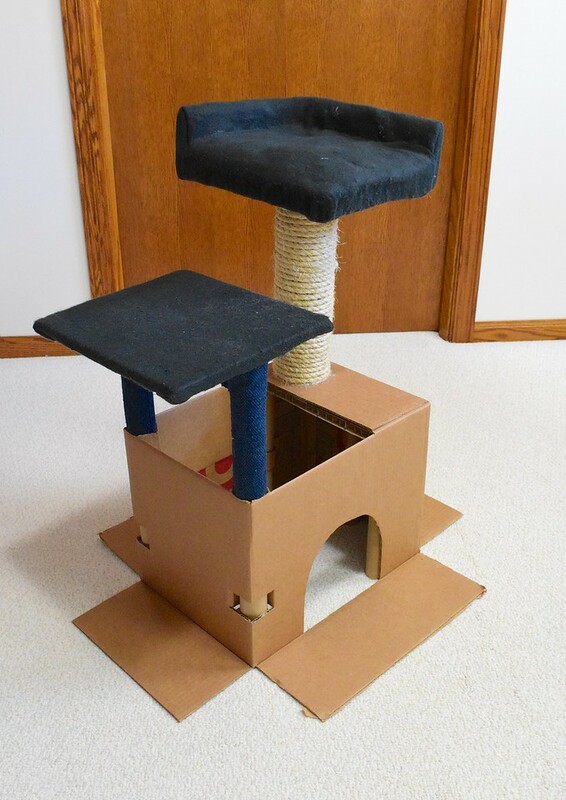 Then it came to my attention that in some cases, cats actually preferred these cardboard scratching things over the more traditional ropey or carpety ones. 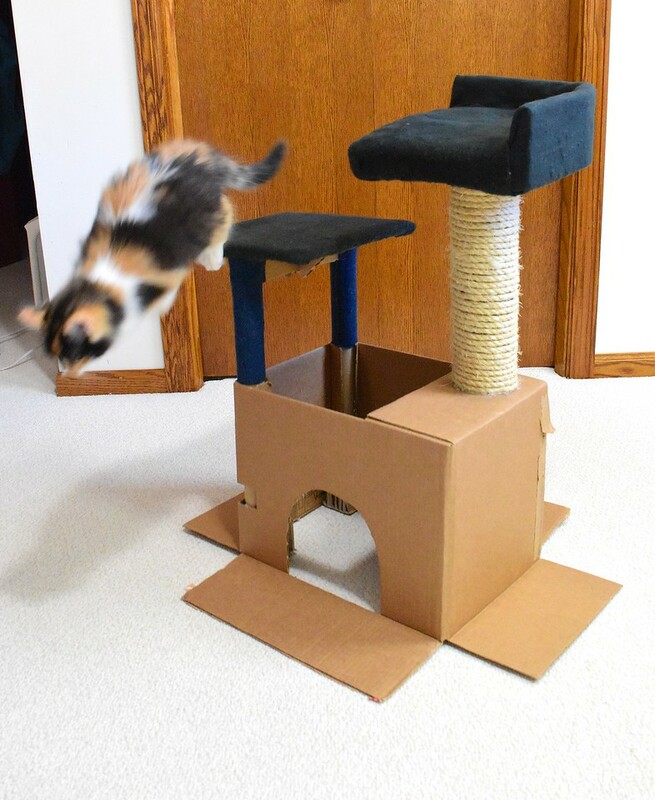 And I wondered if instead of the feral monsters with a nasty penchant for willful destruction, maybe cats were discerning creatures with taste, after all. 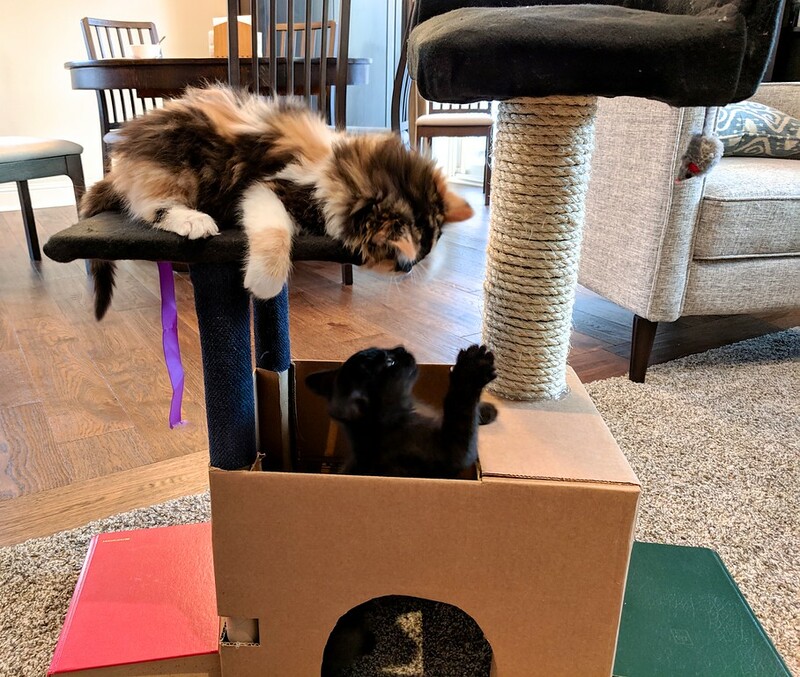 Which was later confirmed with the arrival of a truckload of amazon shipping crates (as so often happens during the Advent season): after they were divested of their contents, the kittens spent many happy hours energetically jumping into and hiding in the empty boxes. "Ah", thought I with deep contentment as I watched them, "we are knit together in soul, for we love similarly." 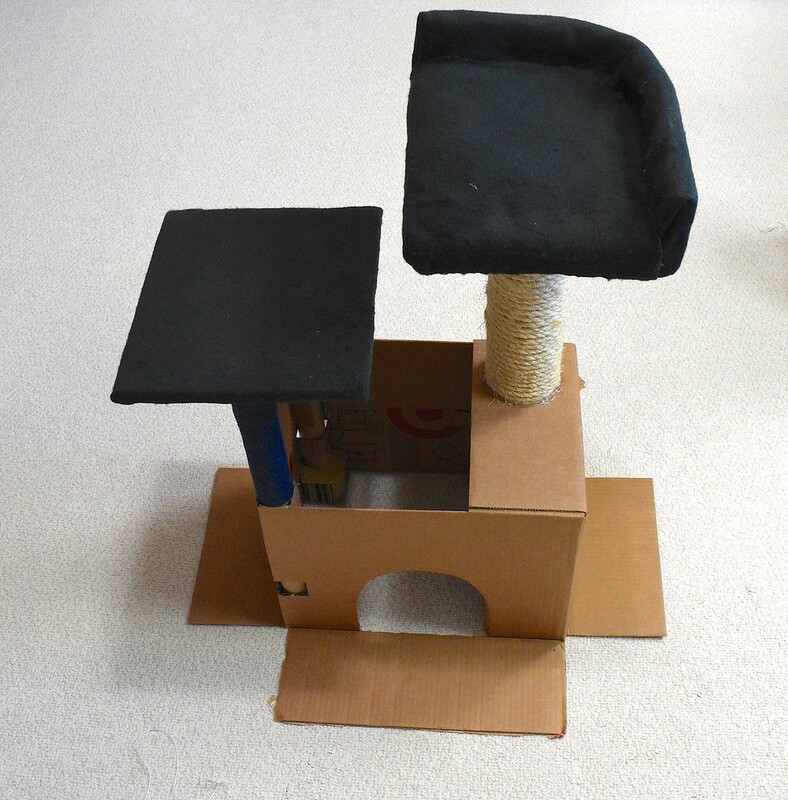 Then, later, having purchased our litter boxes and finding ourselves one short, we sacrificed one of those amazon cardboard boxes to fill in (literally). 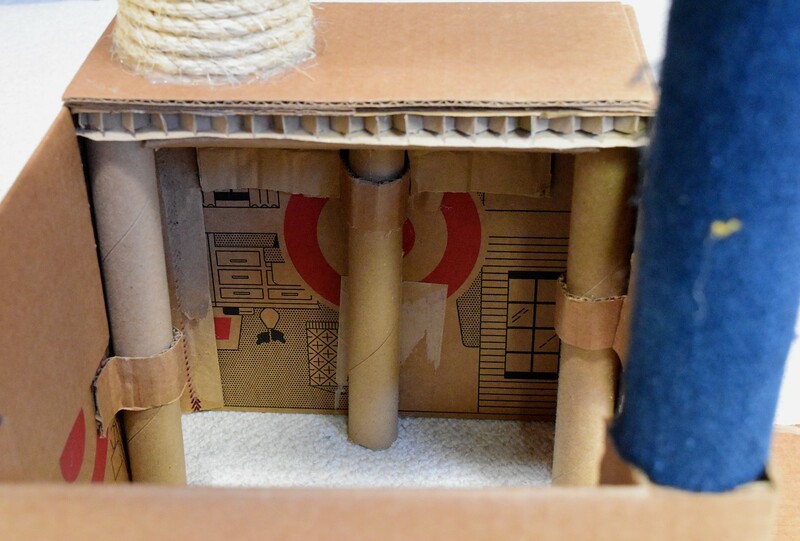 Well, of course weren't foolish enough to just dump litter in as is - we had more respect for cardboard than that! We lined it with packing tape first to waterproof it and then dumped the litter in it. Guess what? 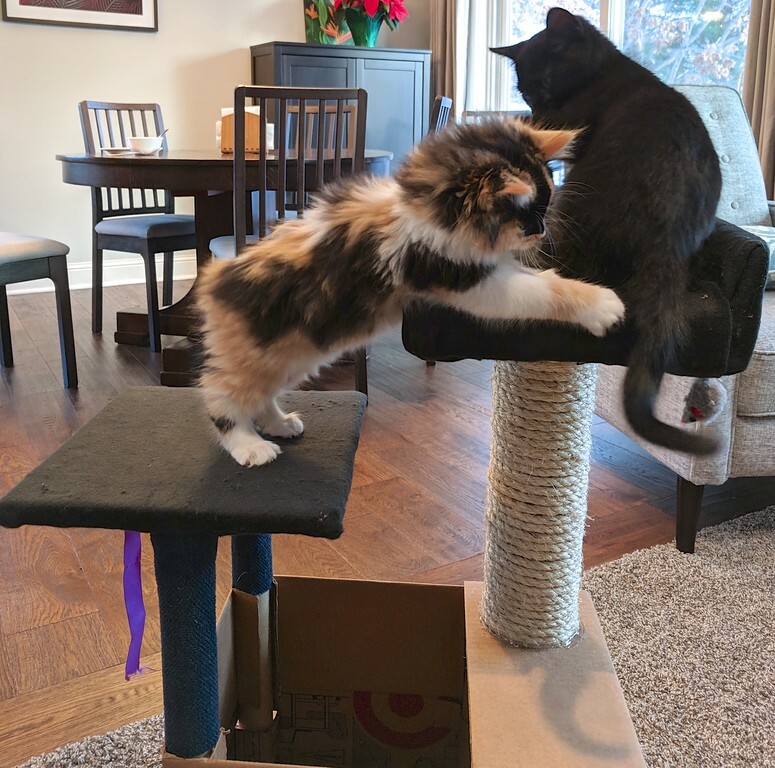 The kittens did not use it. And my esteem for cats as a species shot through the roof. 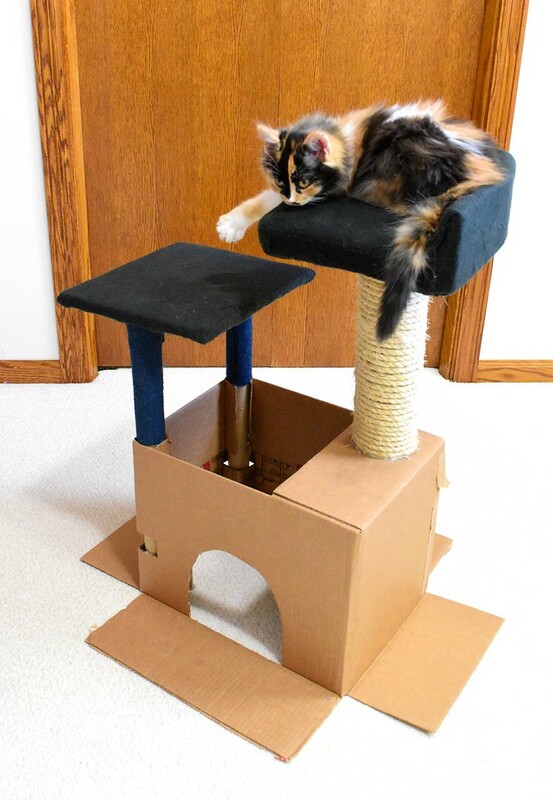 Because clearly, these marvelous animals not only appreciated cardboard as a superior entity in itself but also knew innately to reserve it for only the noblest uses. It is an evolutionary triumph in no uncertain terms. 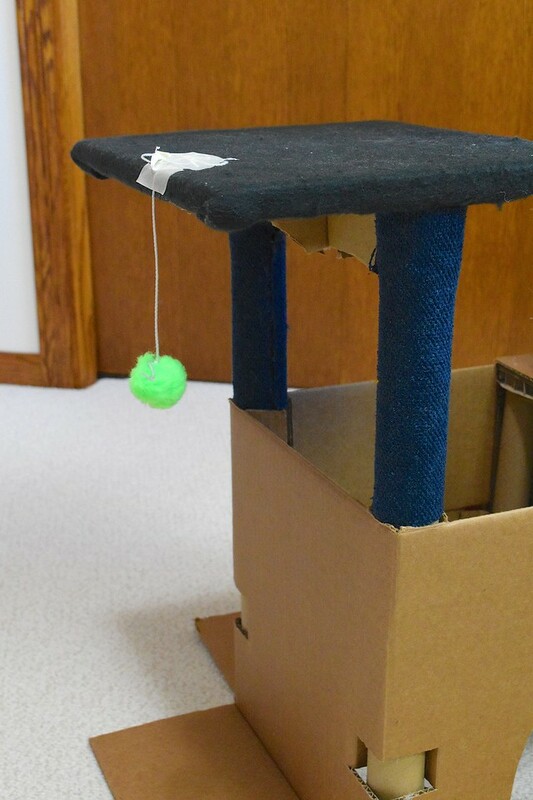 Thus inspired, I set forth to construct for them an Emergency Climbing Toy. The progress of which I shall share in excruciating detail, but first, some preamble. I am not a cat expert. 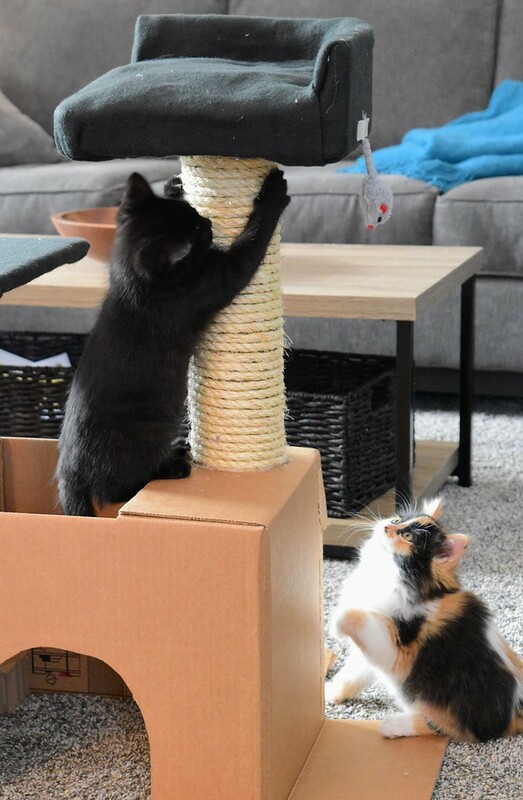 I have close to zero experience with cats, but I have received helpful advice about Climbing and Scratching and Claw Sheaths and Muscle Stretching and Elevated Vantage Points, all of which pointed to the need for some kind of thing for kittens to sink their tiny little talons into and clamber up and down. It was either that, the internet said, or we say goodbye to our furniture. I quite like our furniture, so I was sold. 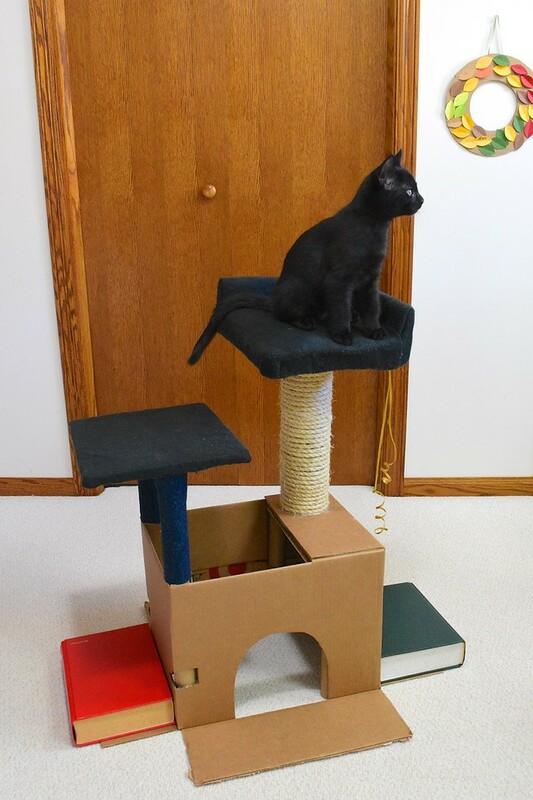 That said, cat towers are enormous and our house isn't set up to easily accommodate anything of that size. Plus they're pricey. And being barely weeks to Christmas, we weren't ready to do the research to find a tolerable non-behemoth with decent reviews. So we bought sisal cord with the intention of wrapping a trashcan to turn into a decorative and functional planter that might also serve as a scratcher. Clever improvisation, we thought. Then the kittens grew overnight and before we knew it, were themselves taller than the trashcan. While all around me, the closer we drew to Christmas, the mountain of cardboard and cardboard boxes grew. Obviously, it was a sign. 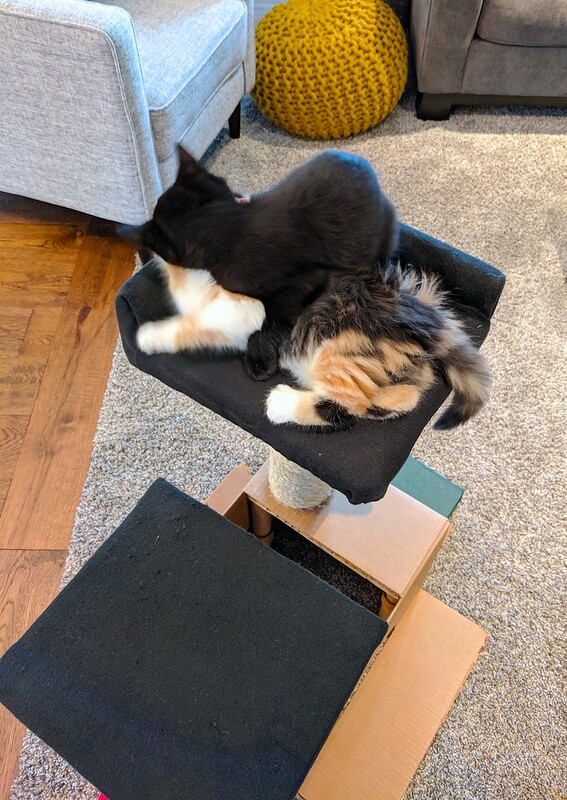 It took a while, because I had to devise ways to make the structure strong enough to support not only the weight of two growing kittens, but also be stable enough under the forces of their motion and play while on it. And grow they did, incidentally. I had to enlarge the arched opening at least twice during the build. This is the lower of the two platforms which rests on a pair of narrow tubes. Incidentally, Maisy and Milo would come and visit every time I sat down to work. Not only on this project, but every other one, really - and they are little rascals, it turned out. The surface of my measuring tape is now pocked with little teeth marks, and they will insist on slinking by and sitting exactly where I need to draw a seamline on my drafting paper. 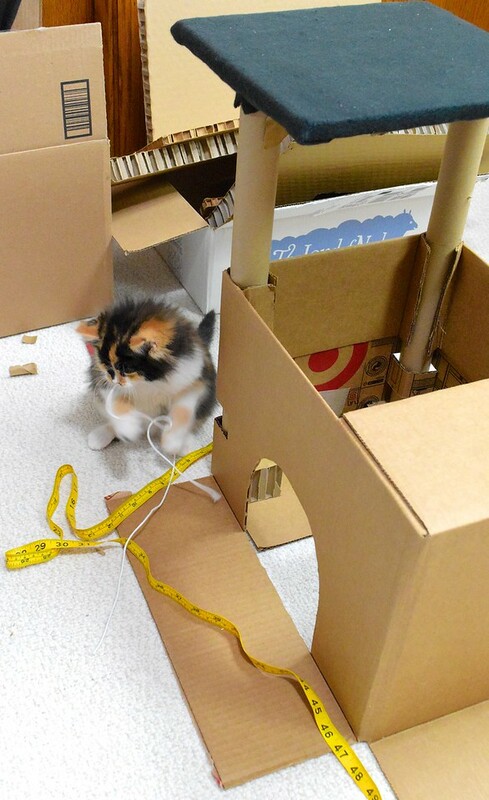 Above all, if having toddlers around glue guns and scissors was a hazard before, it's nothing compared to kittens. Infinite safety considerations. And so much fur to get stuck on masking tape. Yet they are so delightfully curious about everything, and so easily impressed by even the least interesting scrappy bits of randomness. It's like being alive for the first time just to watch them. 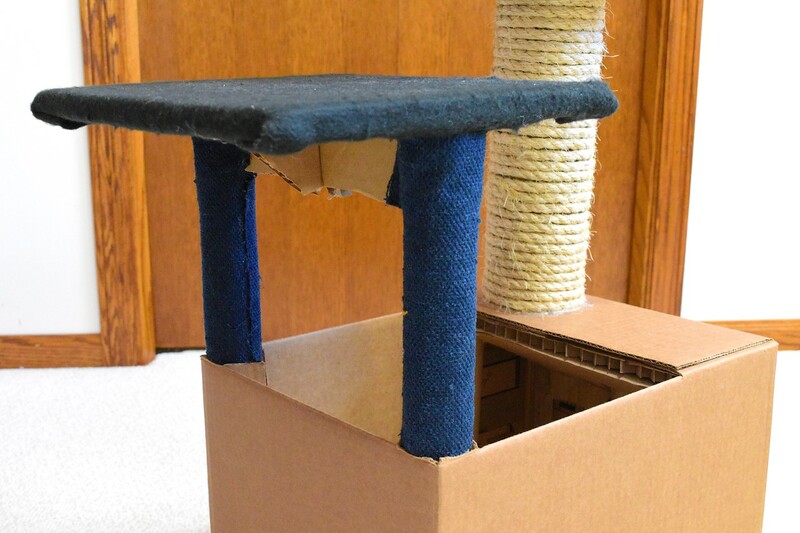 The platform itself is a thick flat rectangle of cardboard wrapped around with fleece. The supporting posts are two wrapping paper tubes wrapped in upholstery fabric that has a short pile, like a very bald carpet. Maisy, it later turned out, loved scratching them. Here is a view of the underside showing the supporting beam between the posts. The posts extend to the bottom of the structure and are held in place with two side flaps and an inverted corner. Even without glue, this combination produces a really effective and snug hold. Plus, it's so easy. First, fold down the natural top flaps of the box so they lie against the inside of the box. Slice about 1.5" through the fold at the corner of the box to enable you to bend about 1.5" of the flap back on either side of the corner. This makes two side flaps as shown, between which you can shove the tube. 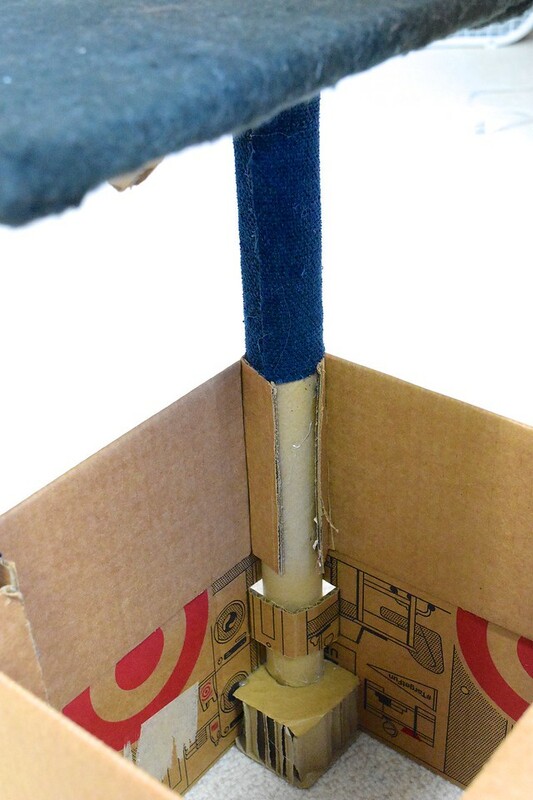 The natural tension of the cardboard will make the side flaps want to straighten out, which grips the tube between them. 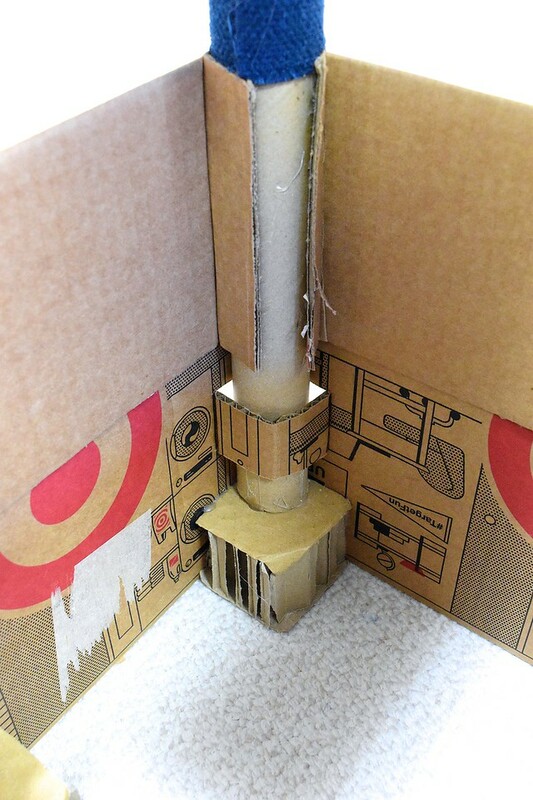 That inverted corner is simply two horizontal slits cut into the corner of the box and pushed inward to create a square collar into which the tube fits. The tubes I had on hand were not as long as I needed, so I propped them up with that cube of thick cardboard which added a good 2" to their height. Here is the view from the outside of the box - you can see the two slits that created the inverted corner on either side. 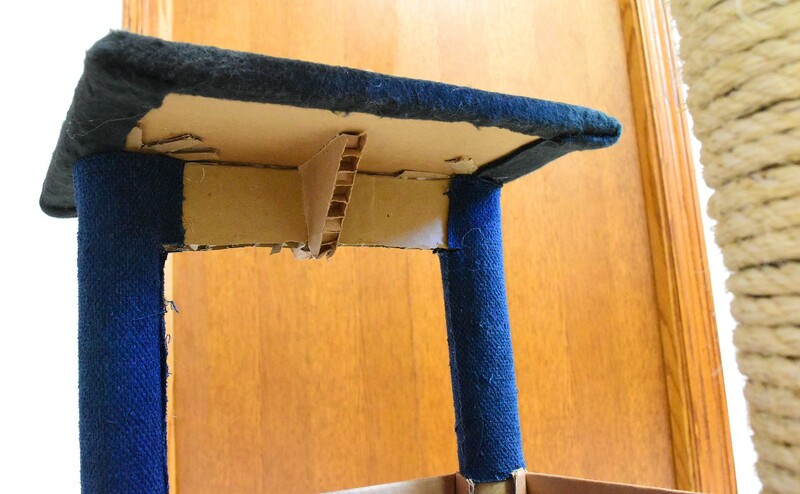 You can also see where the blue fabric-covered posts insert into the box, the rough edges where the fold of the box flaps has been cut to create the side flaps. This is the sisal climbing tower. 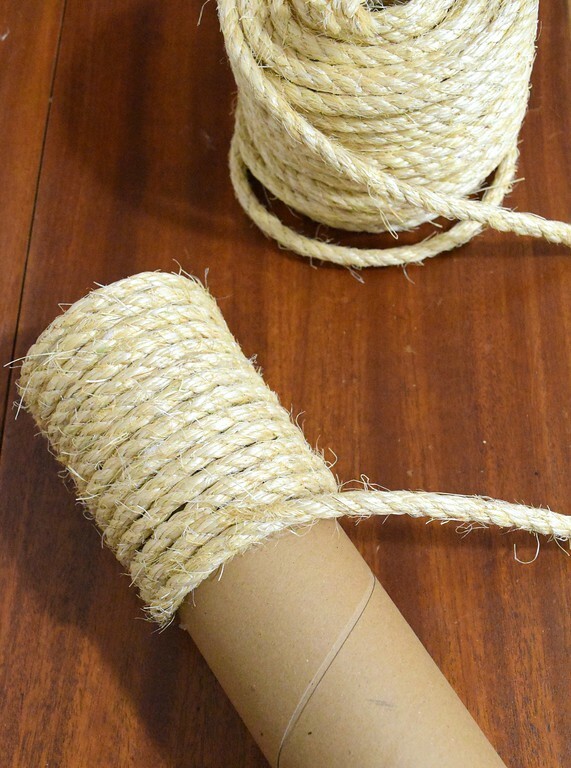 It's sisal cord wrapped around and glued to a rigid cardboard mailing tube. held in place against the walls with more collars. 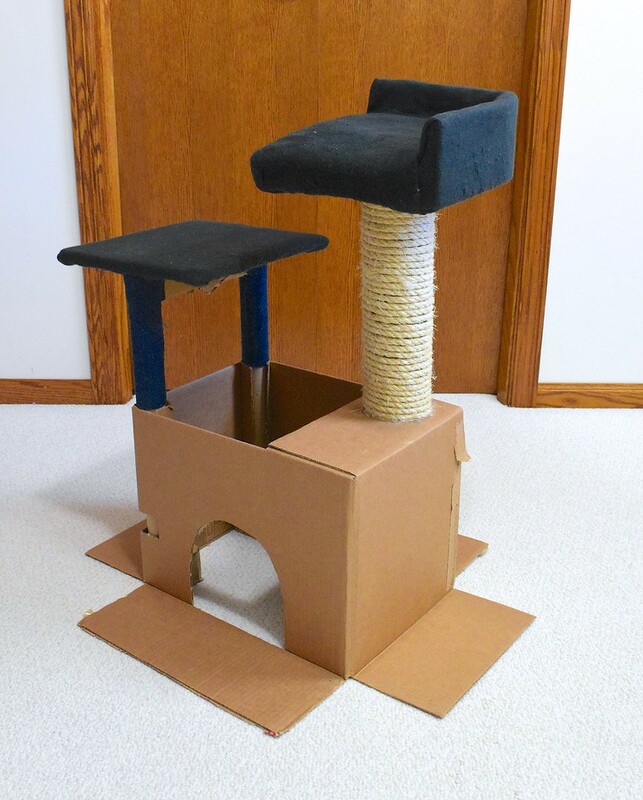 Here is the finished Cat Tower. 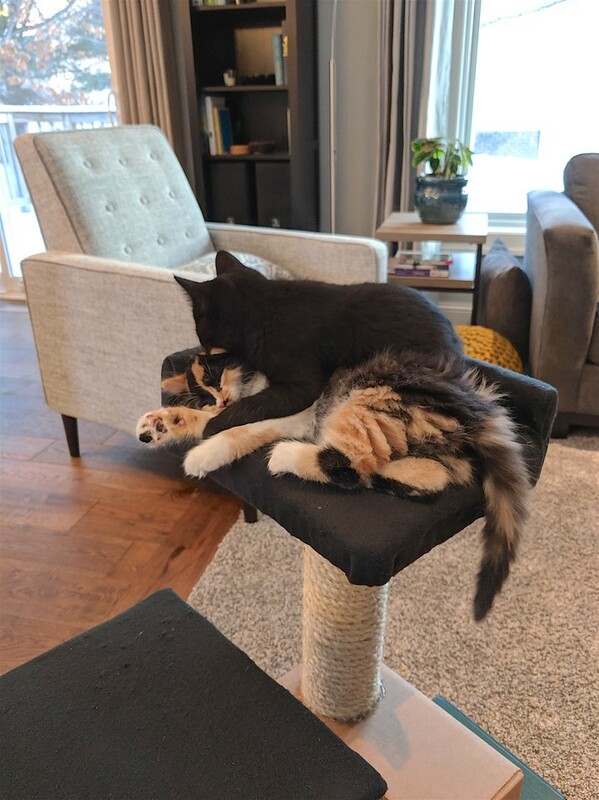 I took these pictures last week, after the kittens have been at it for over a month. The black fleece is a bit beat up, and in some of the later pictures you can see glue that dried on the backrest of the upper platform where I spilled it. 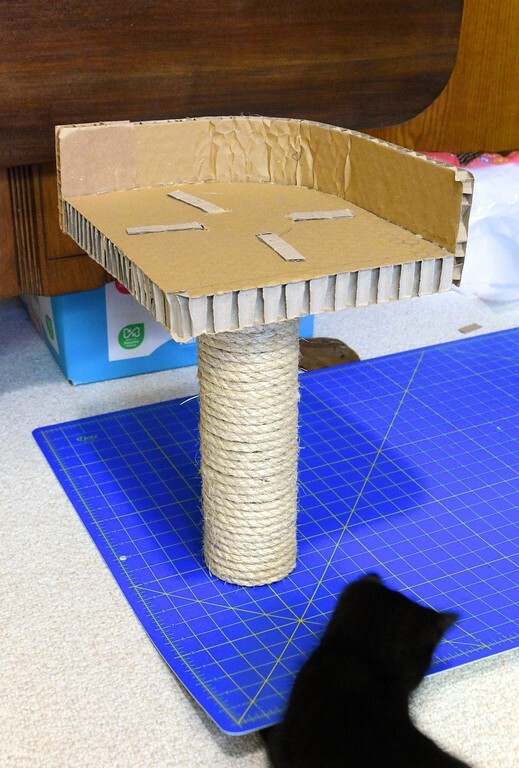 When I next remember, I must stick some fabric on the cardboard surface beside the base of the sisal tower - when the kittens jump onto it, it's a little slippery. Here are the cats playing on it. Already they're outgrowing it, but it was nice to be able to customize a smaller structure for them while they're littler, and then toss it out when they've outgrown it. The roll of sisal cord was only $12, of which I used about 1/4, and everything else was already in the house for free. 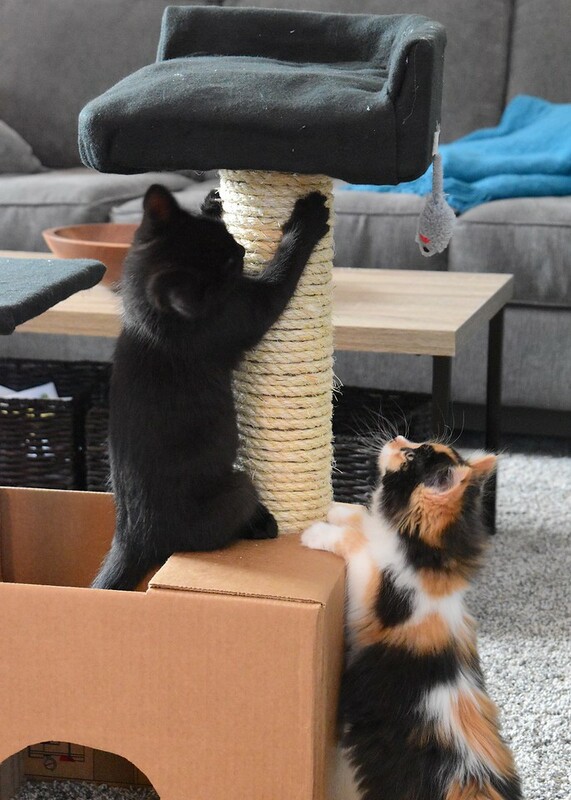 Another nice thing about customizing a cat tower is adding dangly things to entice the kittens to come and play. During Christmastime, it was curling ribbon. You might notice in the pictures that there are two heavy books on the bottom flaps of the box. 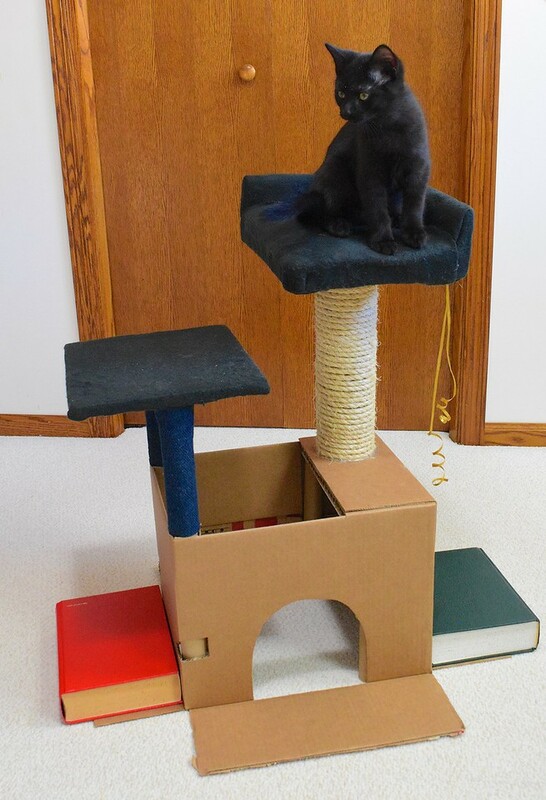 Having the flaps splayed outward on the floor is an aid to stability but as the kittens get bigger and heavier, they needed the added weight of the books to steady the entire structure. And what of the surplus sisal cord? 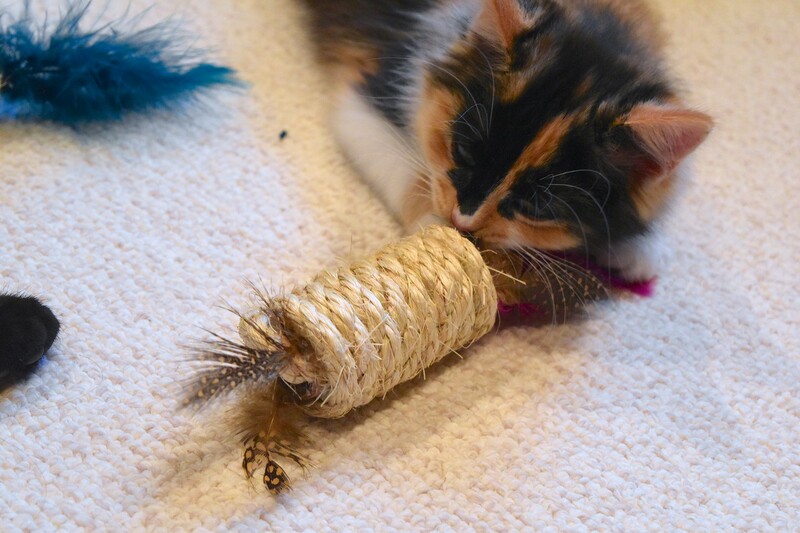 I turned some of it into cat toys. 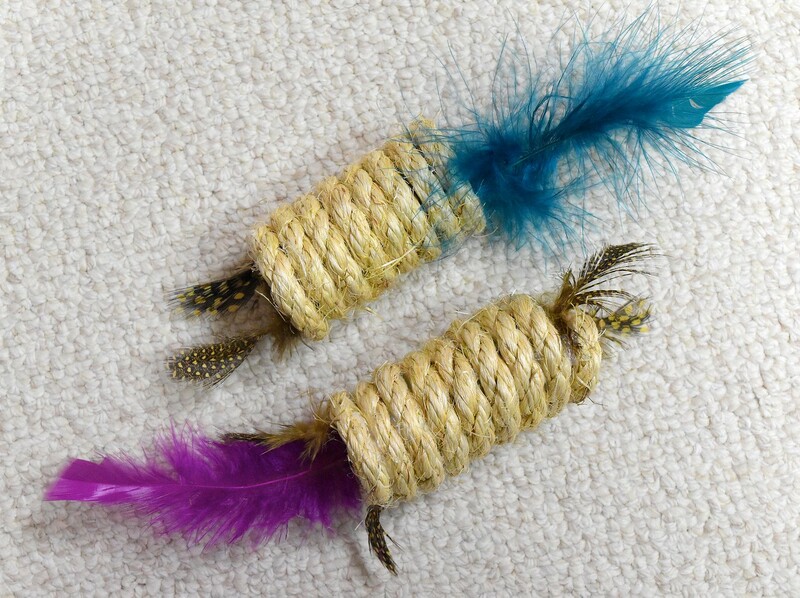 They're simply sisal cord wrapped around a skinny cardboard inner tube, with feathers glued to the ends. The cats liked them for a while. But I suspect they secretly prefer chewing on random cardboard scraps left over from the build. Who wouldn't, really? 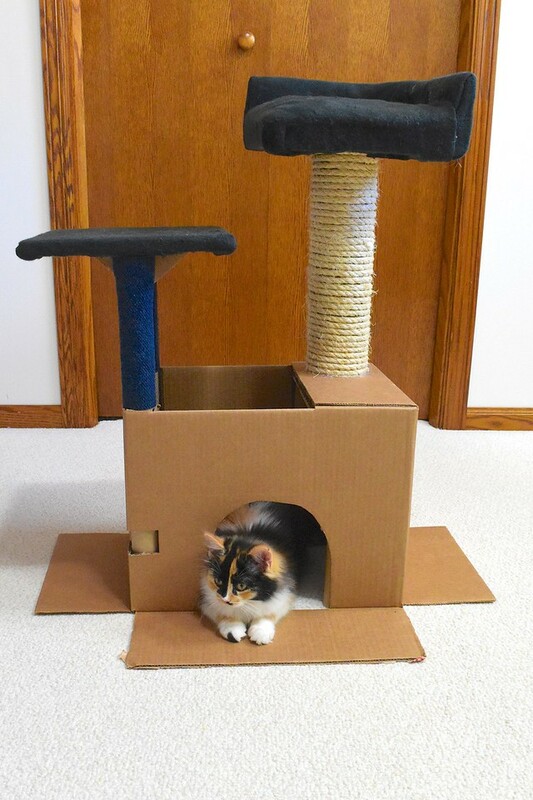 Nice build and the kitties sure are enjoying their home-made cat tree play structure. 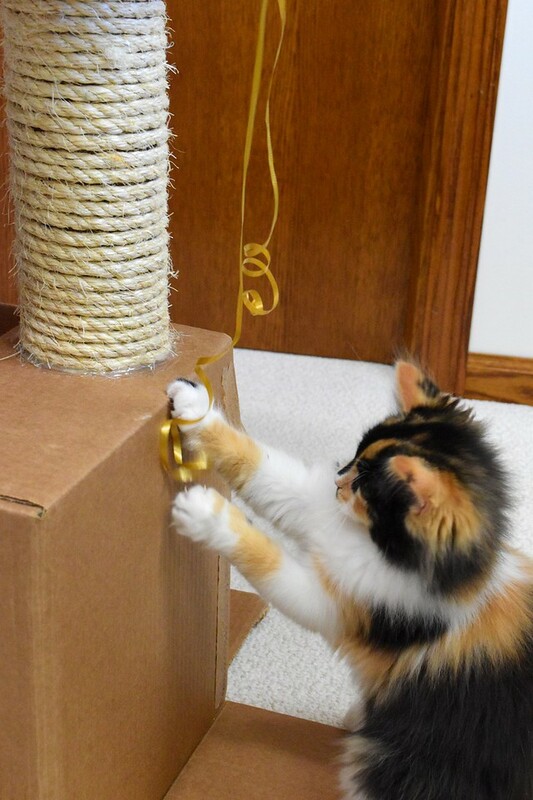 One thing I have to advise...no curling ribbon for cats, or if you must let them play with it, very very close supervision. 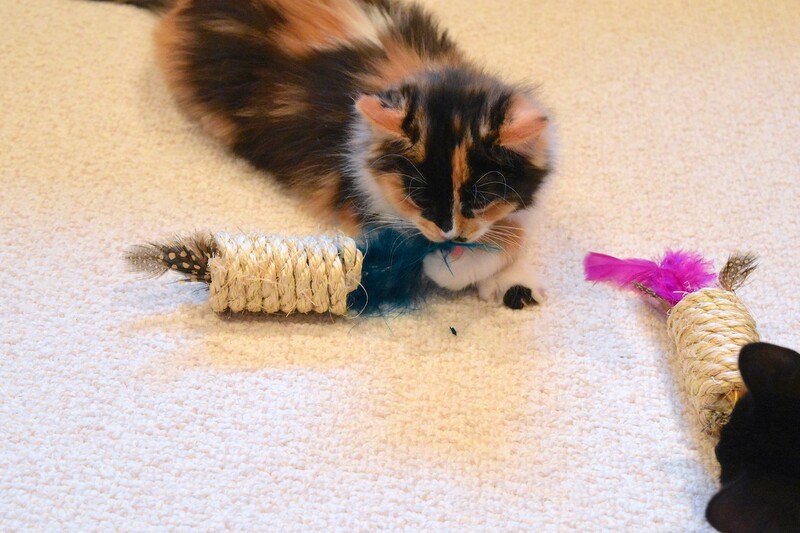 If curling ribbon is accidentally ingested, curling ribbon could cut the insides of a cat's digestive tract. Curling ribbon is banned in our house. 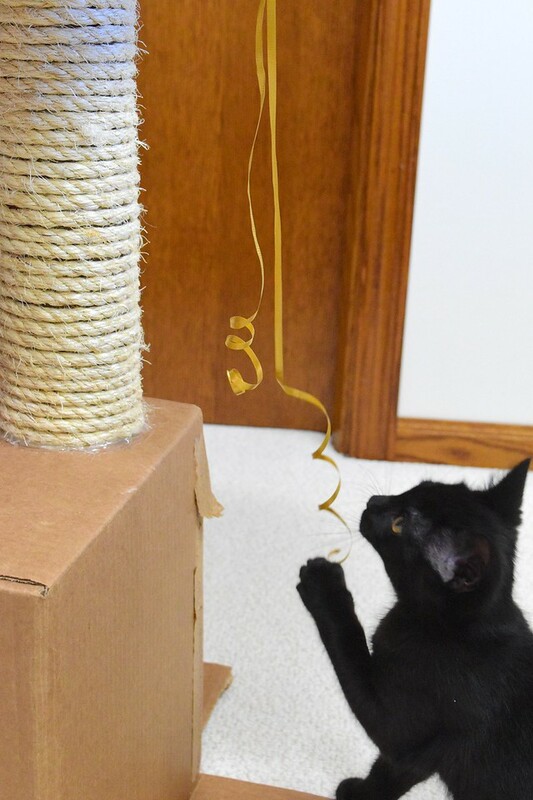 During Christmas and birthdays, if a gift enters the house with curling ribbon, the ribbon is immediately taken off and thrown away in a garbage can our three cats cannot get into. Wendy T: Thank you for the caution! 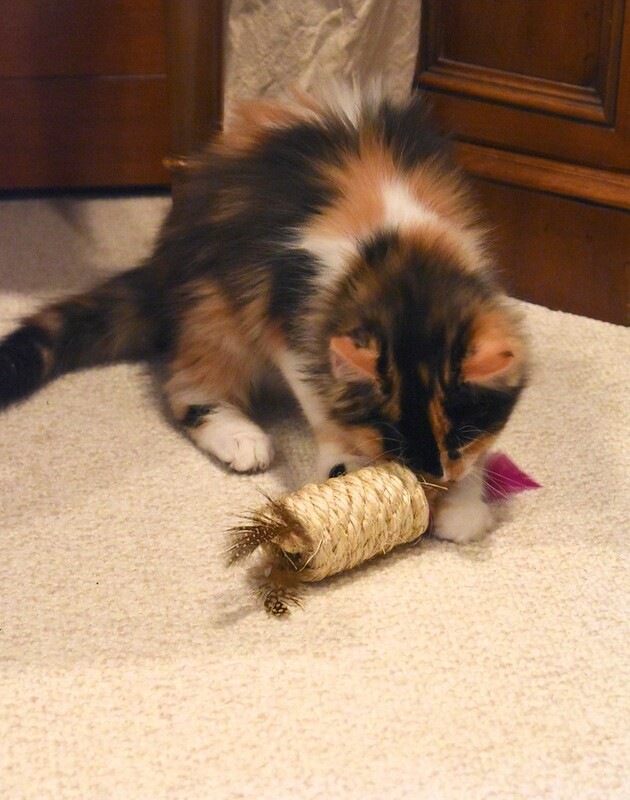 Fortunately, out cats were only marginally interested in the curling ribbon. 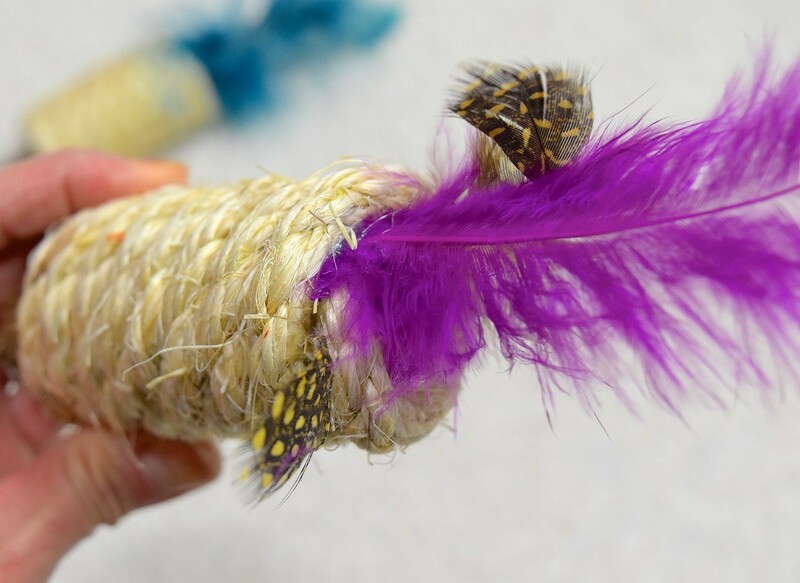 We've also heard similar things about yarn and any kind of string that can shred off - not so much for cutting their insides but for knotting and jamming. Appreciate all the advice we're receiving, though. It seems all the things I've grown up hearing about cats (they like milk, for instance) are turning out to be harmful for them (lactose-intolerance post-weaning). Thank goodness for the internet. Same goes for dental floss - best to discard it in a covered garbage can. But if your kitties eat hair, they can digest it okay. I agree, this is great! I need to make this for my babies ASAP! They're too lazy on the couch, lol. Lucky Babies! Mine at 16 & 13 do a lot less playing, but the penchant for being on whatever I'm working on continues! Excellent build! 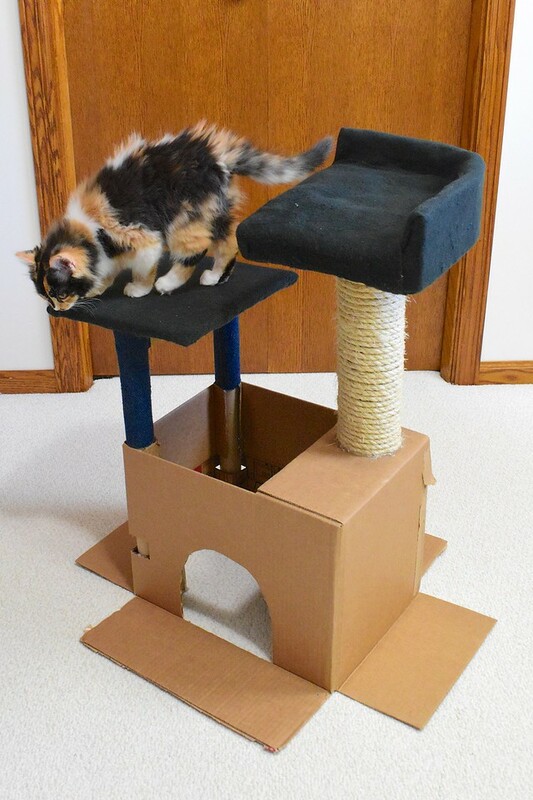 And having inspected many manufactured cat towers and scratching posts, I can say "better and safer" as well. 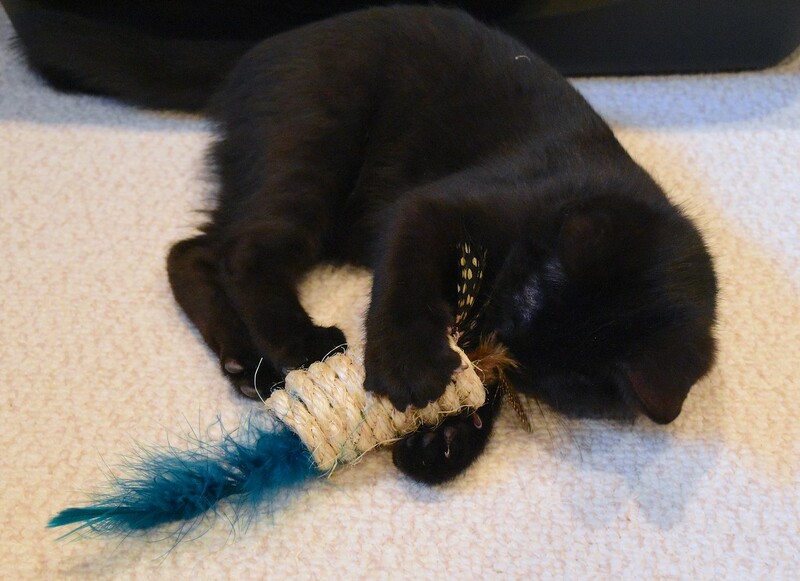 The manufactured ones often use metal connecting parts (some of which stick out) and many, many staples (for example, in the sisal-wrapped posts, where they can easily catch a cat's claw in a painful and even dangerous way). 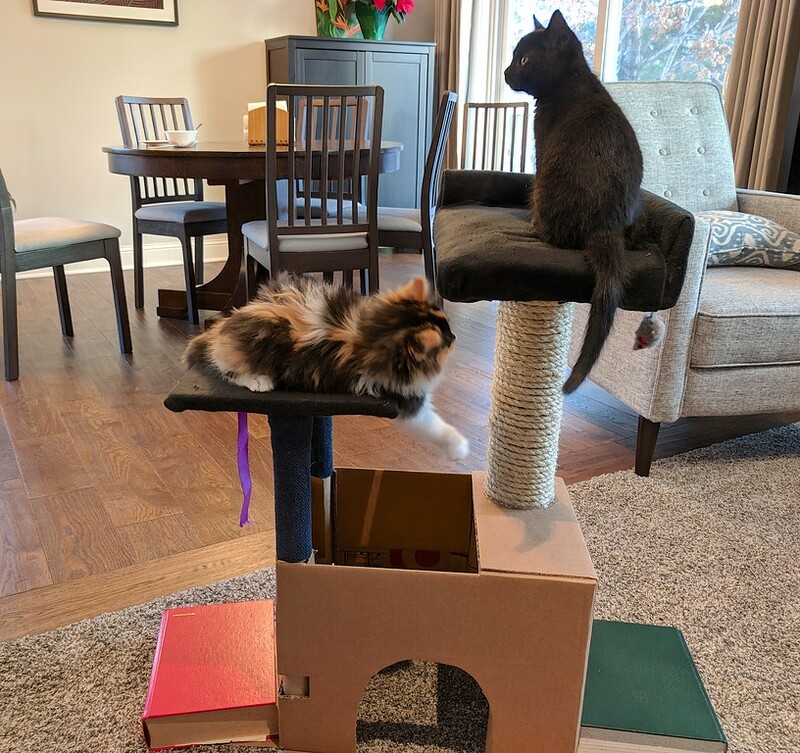 I bought a rather large and expensive one during a sudden construction project, because the cats were being confined to one part of the house during the day when the workers were tromping around, and I wanted them (the cats) to be entertained. Ever since I've been meaning to dismantle it and either replace it completely or rebuild it properly. I am living vicariously through your cat posts. Our dog just wants to chew on rawhide. 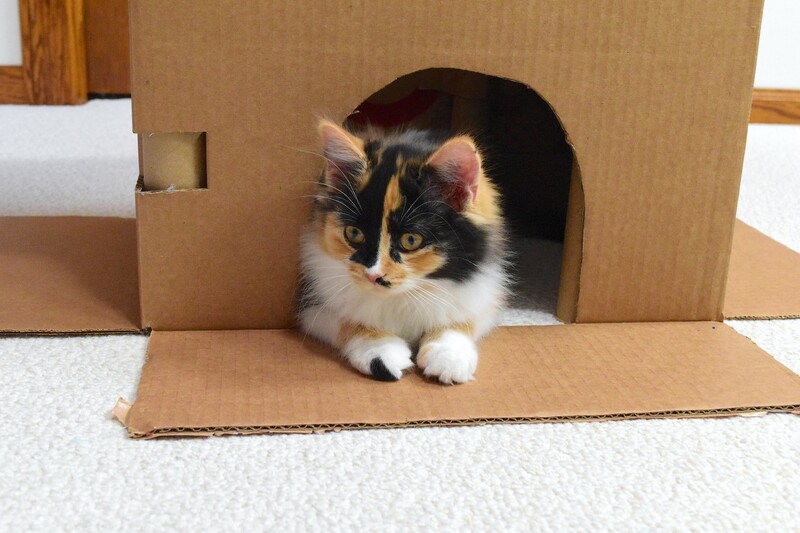 Although she will shred cardboard, given the chance. 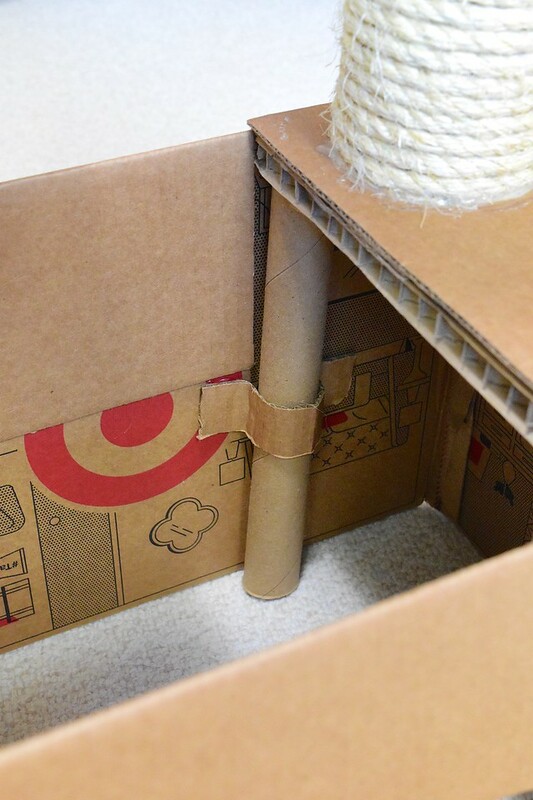 I have a massive box fort on my blog. 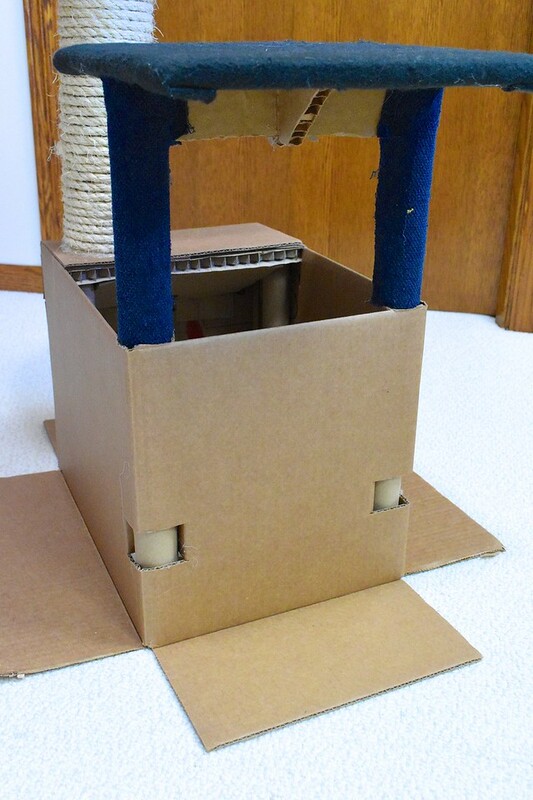 I never blog anymore but Pierro and Miles love that box fort. I have several pictures and views around the last few years I blogged over there. 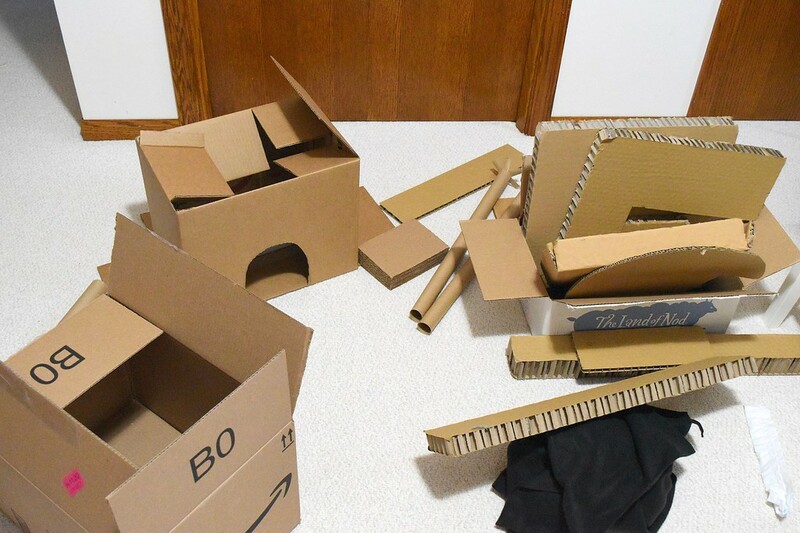 I love cardboard too and have a lot of cardboard creations.